What if a malicious party (say, your closest competitor) starts using those techniques on your site just to try and get you penalized? This, ladies and gentlemen, is something that is commonly known as Negative SEO. Negative SEO is the act of using Black Hat SEO on other websites in order to get them penalized by Google. Negative SEO can also include reducing the effectiveness of a website’s SEO properties by disabling or altering them. Negative SEO in a nutshell. Dealing with Negative SEO tactics can be quite tricky since some of them is out of your control, like pointing bad links (a.k.a link bomb) to your site. Another thing is, they are also a bit hard to detect. Unlike some hacking practices that aims to deface or simply take down a website, a Negative SEO attack doesn’t affect a website’s look and feel. Instead, the effects are only apparent once your website takes a dip in search ranking and incoming traffic. But Why Would Anyone Commit A Negative SEO Attack? Similar to hackers, people who do Negative SEO attacks might do it for various reasons. It can be intentional, such as sabotaging a competitor’s website, extortion or simply for fun. Do not be surprised you will find plenty of these Negative SEO Services online easily. And believe it or not, an unintentional Negative SEO attack can also happen. There are cases where family members, employees or even hired SEO agencies deliberately do obsolete Black Hat practices on behalf of the owner thinking it will help their website ranking. Link farms are a series of web pages created for the sole purpose of linking to another page on the web. Ordinarily, inbound links are a good thing that help to improve your site’s ranking… but if you have a lot of links coming in from same unrelated, spammy websites, it tells Google that you are trying to artificially increase the number of links pointing to your page by creating link farms and you will get penalized. No, not exactly like that.. In a Negative SEO attack, malicious parties will create obvious link farms and heavily link to the target website. Sometimes they will also purchase link farm services or buy site-wide ads to achieve the same effect. Since it’s hard for Google to tell who’s responsible for the links, it can lead to a Google penalty on the target site when detected. Copyright complaints are a bit more complex, but at their core, they usually involve a someone claiming that you’ve posted material that belongs to them. In many cases, this can result in an automatic removal of the page for up to 10 days – and wouldn’t it be just awful if your landing pages vanished right in the middle of your biggest campaigns? Finally, competitors can falsify duplicate content – basically just copying and pasting your web pages over and over, maybe even as part of those link farms we discussed above. An influx of duplicated contents across domains might signal a manipulation attempt to get multiple different websites ranking with the same content. This used to be a popular Black Hat SEO technique before Google started cracking down on it. Massive amount of duplicate content can land you a penalty even if you’re not the one responsible behind it. As you can see, there are many different ways for negative SEO techniques to be done to your website… but no matter how tempting they might be, you should never even consider doing any of these yourself. Even if it works in the short-term, it’s not going to be effective forever… and could land you in serious legal trouble if anyone can prove you were behind it. This form of attack is a little different, and generally focuses on hacking into your site and changing things around. With as little as a few minutes to start messing with your setup, a hacker could easily disrupt your site’s coding, introduce viruses, and generally wreak havoc on everything you’ve tried to build. Negatively altering your SEO properties: Let’s be honest – are you really that likely to notice if someone changes all the alt text on your pictures to be less effective? A lot of basic SEO techniques are intended to be “set and forget”, and that’s what can leave you vulnerable to on-page negative SEO strategies. Changing the Robots.txt: This is easily one of the most important files on your site when it comes to SEO because it tells crawlers how to interact with your site. It is normally used to tell Google which part you don’t want them to crawl and index such as a live but unfinished page. An attacker with access to your site can easily modify the robot.txt to tell Google to ignore important pages or even the whole website. A small change is all it takes to tell Google to completely ignore a website. Modifying Redirects: Search engines have an opinion on certain error pages – namely, they’re bad. Sites that automatically redirect from bad pages generally aren’t penalized too much, but if your redirects are changed, disabled, or scrambled, you could find yourself plummeting down the ratings. The good news, as we’ll discuss later, is that on-page negative SEO attacks are much harder to perform… and much easier for a competent programming team to fix, too. Negative SEO services are not hard to find, but are they really worth it? With all the stuff we’ve talked about here, you might be worried that there’s a rampant amount of negative SEO going on and you just haven’t caught up to it yet. Google is quite good at detecting when negative SEO is occurring. For example, if someone’s trying to do some Google Bowling and smash you over with site-wide links, there’s a good chance that the link from that site will only be counted as one vote from them – unlikely to do you any real harm. Also, remember that while Google is actively hunting down Black Hat SEO practices, some might slip through for a while. This means that Negative SEO attempts won’t guarantee a penalty from Google for the victim. Not only that, it might even do the opposite and actually help the target to rank better! Google have already taken into account the possibility of framing others when designing their algorithm. Similarly, hacking attempts are not that hard to avoid as long as you are using a robust system securing your site (make sure they are updated). Also avoid using simple administrator passwords just because you think nobody is interested in ruining your humble site. You know what they say – better safe than sorry. In general, Negative SEO can be costly, takes a lot of effort and is highly risky. The return on the other hand, isn’t even guaranteed and while it might work, it’s quite easy to fix once the target realize what is happening. In short – Negative SEO is a high risk, low reward activity. Unless there’s a very compelling reason (revenge maybe? ), it is quite unlikely for anyone to attempt on doing it. The most likely websites to be targeted for SEO are those in highly-competitive, high-money fields – gambling sites are a common example of this. Sites that are in calmer niches are far less likely to be hit by negative SEO – indeed, anything that happens is more likely to be an accident or a remnant of an old advertising strategy instead of a deliberate attack on you. That doesn’t mean you should be complacent, though. Constant vigilance is the best way to protect your site and your reputation, so let’s look at what you can do to help protect your site. The first step in protecting your website is to detect any signs of attack such as a sudden drop in organic traffic. This is easy to notice if you are constantly monitoring your traffic through Google Analytics. A sharp drop in organic traffic usually signifies a Google penalty. You can also set up Google Webmaster Tools Email Alert. This will allow Google to notify you through email if your website is not indexed or receive a manual penalty. If you haven’t done anything wrong, that can mean that your website is under attack. The sooner you know, the faster you can react and minimize the damage. Google’s answer to Negative SEO is the Disavow tool. You can see the full process here – what it comes down to, though, is basically saying “I don’t like or trust that link, please don’t factor it into my rankings”. By disavowing low quality links, you avoid associating your website with them so that your ranking and reputation is protected. Use the Disavow tool to let Google know you don’t want low quality links. Utilizing the Disavow tool also tells Google that you care about the quality of links pointing to your site. This will be taken into consideration when Google’s Webspam Team is considering whether to penalize your site when they detect an influx of bad links pointing to it. Hackers generally require some sort of administrator access in order to mess around with your site, and by adding additional levels of security, you can drastically reduce the odds that they’ll be able to break in and start disrupting what you’re doing. This isn’t tied to a particular problem, but you should regularly revise your SEO properties. This includes checking out your robot.txt once in a while or performing random checks on your contents’ internal coding (headers, image alt tag etc). It wasn’t this bad the last time I edit it! If you are using SEOPressor, checking SEO properties will be much easier as each contents will have it’s SEOPressor score. If you regularly optimize your contents’ SEO properties to get high SEOPressor score, then you can easily spot the ones with bad score and fix them. It is always better to be active and aggressive in searching for attacks on your site, rather than locking it up and expecting that nobody will be able to get in. Make no mistake – negative SEO attacks are a real threat, they’re just not a common one. And even though you can disavow links or report them to Google, it might take some time before Google can conclude that you are innocent and not the one who’s behind the Black Hat practices. It’s better to be safe than sorry. 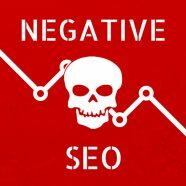 Now that you know what is negative SEO, set aside some time every now and then to check for negative SEO, and if need be, resolve it using whichever technique is most appropriate. It is also a good idea to just be nice to others and avoid giving anyone any reason to attack you in the first place. After all, being nice is free. This post was originally written by Azfar and published on October 28, 2015. It was most recently updated on August 2, 2018.